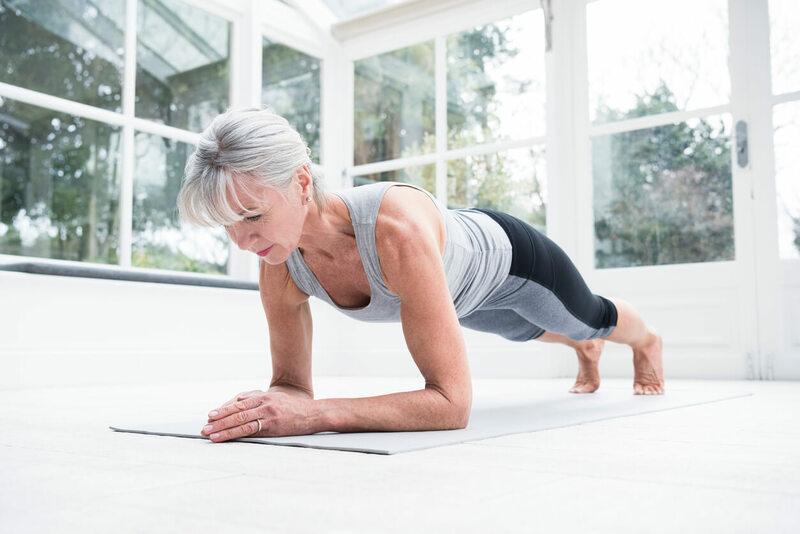 A pain-free back starts with a strong core, but that’s not the only benefit you’ll get from strengthening those muscles. Harvard Health Publications notes that balance, posture, and stability all improve with a strong core, and activities like sports, housework, gardening, and even simple daily actions like sitting, twisting, lifting, and bending are easier and more efficient when those core muscles are strong. Keep in mind that your core is more than just your abdominals. Core muscles include those in your abdomen, back, sides, and even your upper legs: glutes, hip flexors, abductors, and adductors. For best results, it’s important to strengthen all of them. Here are five excellent core strengthening exercises to add to your workout routine. Lie on your back with your feet on the floor, knees up. Tuck your chin up slightly, as if you’re gently holding an orange between your chin and your chest. Exhale as you press your navel toward your spine and lift your shoulders off the floor. Hold while you finish the exhale. Inhale to lower your shoulders to the floor, without completely relaxing your abdominal muscles. You can put your hands behind your head, but take care not to pull on your neck. Remember that it’s not a huge movement. Your shoulders will only be lifting a couple of inches off the floor. Keep your low back flat against the floor, and keep squeezing your navel down. Start on your hands and knees, with your knees below your hips, wrists below your shoulders. Lift your navel slightly to support your low back. Inhale as you stretch your right arm forward and your left leg backward. Exhale as you bring them back to the floor. Repeat on the other side, alternating between right and left for the entire set. Lift your leg and arm to the level of your hips. Keep your back strong. Don’t arch your back when you lift your limbs. Lie on your side, and bring your elbow to the floor below your shoulder. Straighten your legs and press into the bottom leg to lift your hips off the ground. Hold, then repeat on the other side for the same amount of time. Keep your hips directly between your feet and your head, or slightly above. You can stack your feet, or bring your top foot to the floor in front of your bottom foot to make it easier to balance. For added difficulty, you can lower your hip toward the floor (without letting it touch) as you inhale, and lift the hip on the exhale. Remember to perform this movement slowly and with control. Inhale as you press into your feet to lift your hips off the floor. Exhale to gently lower your hips. Keep your toes pointing forward and press the entire foot into the floor. When the hips are lifting, your knees should be above your ankles. Keep your hips, knees, and ankles in line, so your knees aren’t falling open or squeezing toward each other. For an extra challenge, you can do the bridge on one leg. Remember to keep your hips even. Straighten your legs behind you and lift your knees off the ground. Keep your hips in line with your ankles and head. A common mistake here is letting the back arch and the hips dip toward the floor. Focus on squeezing your navel toward your spine. You can also do this exercise on your elbows. Remember: good form is the key to safe and effective exercise. Our team of physical therapists will be happy to show you how to perform each exercise correctly. Start with a few repetitions and add to that over the weeks as you get stronger. Don’t wait another day to start a core strengthening routine. Within a few weeks, you’ll notice the difference in your daily life. If you do have back pain, it’s a good idea to visit Orthopedic and Balance Therapy Specialists to rule out an injury or another serious issue, for which we might recommend a specific type of exercise or personalized course of treatment. We are committed to achieving the best results possible for you. Above Exercises Too Difficult? Learn Basic Core Strengthening Exercises At My Upcoming Back Pain and Sciatica Workshop.